In 2016, Frances Messano (Managing Partner – NewSchools Venture Fund) and the authors, Xiomara Padamsee (CEO – Promise54) and Becky Crowe (Senior Adviser – Bellwether Education Partners), brought together a group of education funders to underwrite a rigorous study of the state of diversity, equity, and inclusion in the sector. While this group perceived a near-universal awareness of the lack of diversity within education organizations, no one had yet taken on a field-level research project to quantify the issue in aggregate. Our strong hope is that this study inspires our colleagues within education organizations of all types to recognize diversity, equity, and inclusion as a source of unrealized impact and commit to progress as an organizational imperative. 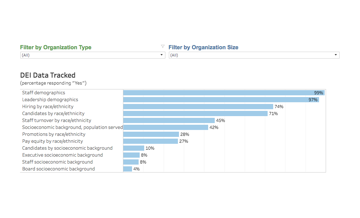 See a profile of the survey respondents by organization type and size, plus race/ethnicity and gender representation by level of the organization. 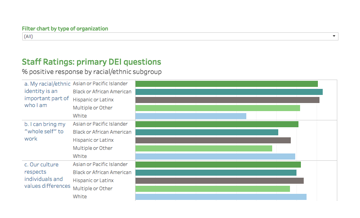 Discover which policies and practices related to diversity, equity, and inclusion are used most frequently by schools, nonprofits, funders, and others. Find out how more than 5,000 staff members in dozens of organizations rate their DEI experiences, their intent to stay in the organization, and other factors. We invite you to take one or both of the surveys used in this study. By participating, you are contributing your organization’s data to the field-wide data set. In addition, you will receive complimentary, detailed reports comparing your organization's results with those of similar organizations. Staff perceptions about diversity, equity, and inclusion in their organizations impact recruitment. Staff are 3x more likely to recommend an organization that is diverse, equitable, and inclusive to a friend. We found a wide variety of practices related to diversity, equity, and inclusion in use across organizations of all sizes and types, however we found no universal set of practices used. Of the nearly 50 practices in the survey, only nine are used by more than half the respondents. On the other hand, all but nine are being used by at least 20% of the organizations. Staff perceptions about diversity, equity, and inclusion in their organizations impact retention. 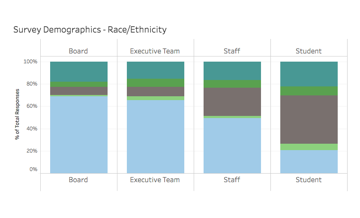 Staff – especially staff of color – are significantly more likely to stay in diverse, equitable, and inclusive organizations. Education leaders see many ways that workplace diversity, equity, and inclusion positively impact student outcomes. For example, they see higher expectations and role modeling from teachers and leaders who share the backgrounds of their students and staff, which drive higher achievement. We have several resources and reports available for you to download. The executive summary and full report are below, along with materials from presentations on the study. "Our report, Unrealized Impact, describes four organizational profiles that are based on data from the surveys and you can view examples of Staff Experience Survey participant reports for a typical organization in each profile using the links below. Note that these reports are created using composites of organizations in each profile but do not represent actual data from any particular organization.